It has been snowing here, a little. Just enough to give a frosting to surfaces, but not so much to actually be inconvenient. Unless one is a cat. I opened the door to the balcony and Marlowe headed outside, then apparently teleported back inside. Poor guy has been an indoor cat his whole life so he had NO idea what this white stuff was. 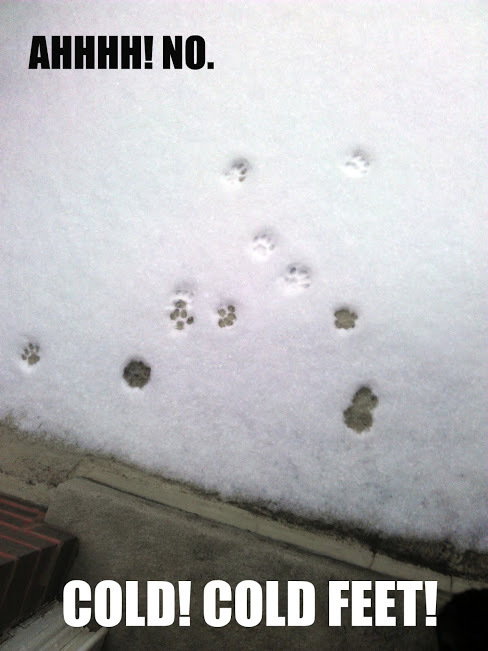 an entire tale in 11 paw prints! How did Marlowe do that? Did he reverse out? He turned tail and fled.